Another Beautiful Day in Paradise. We had a little breeze out of the SE with the temperature in the 80's, the humidity in the 70's and very few clouds. It's starting to feel like summer. Absentees Barbara M & her friend Norm, Amy & Rob, Deb B, Paula C, Rick & Ginnie, Susan & John L and Jeff B came. Welcome back all. We did our planned skate/bicycle route with a few exceptions. We deviated from the planned route by going by Barbara M's house and doing the back trail around Freedom Lake that goes by Bill Jackson's. Fortunately we passed out maps of the route because we had several people get way behind and it is not obvious at all which way to go. Finally Bruce had to ride in the back of the pack while Barbara led the way. All managed to survive and get back to Ginnie's house. Roy indicated we did 9.7 miles. We had 6 bicyclists. We Brunched at Ginnie's house as planned. 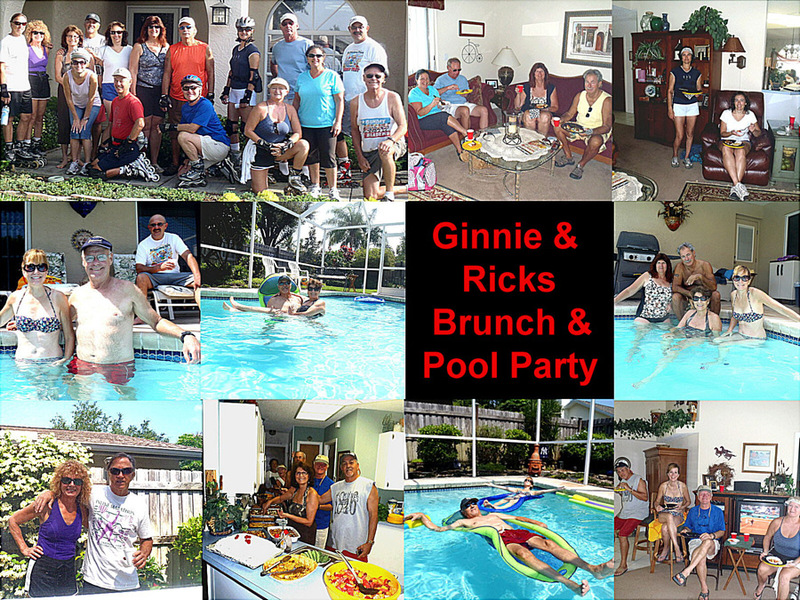 Ginnie and Rick had created a good variety, marvelous and great Brunch for us. We devoured Brunch while we recovered with the help of the cool and dry air conditioning. Next we ventured into the pool. The recent rains had cooled the pool so most eased into the pool. Only Ginnie came crashing into the pool. We enjoyed the pool as well as the beautiful garden surrounding the pool. Thanks Ginnie and Rick for a very pleasant and adventurous time.